To help marketers better understand the latest mobile advertising trends in the in-app space, Pixalate examined data from official Google Play Store apps to identify today’s trending apps in the Android app ecosystem. 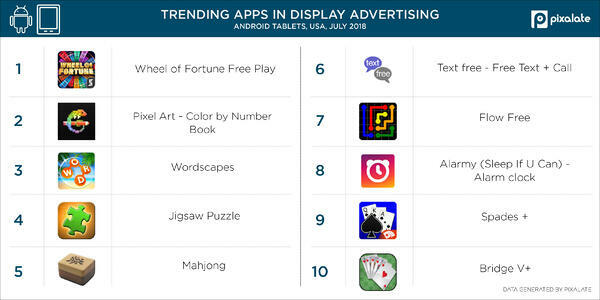 After highlighting the top trending mobile apps in advertising on Android phones, iPads, iPhones, today we are revealing the top apps on Android tablets. 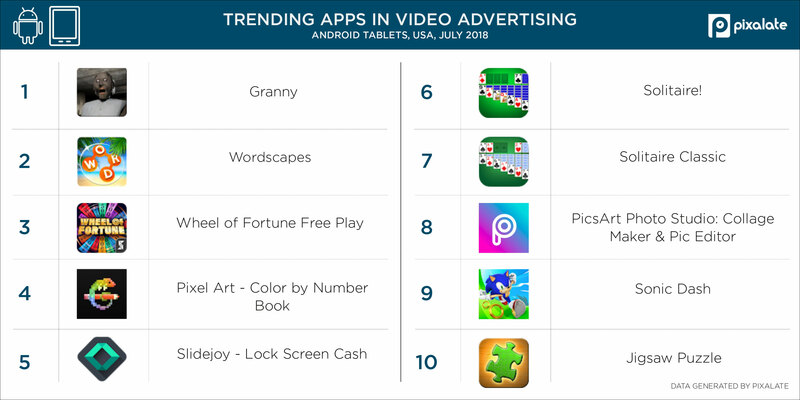 This post highlights the top trending apps in the United States, based on display and video programmatic advertising volume, on Android tablets from July 2018. The top five Android tablet apps for display advertising are in the Games category. Overall, eight of the top 10 Android tablet apps are games. Eight of the top 10 Android tablet apps for display advertising are Games as well, including four of the top five. The top five apps are all in the Games category: Wheel of Fortune Free Play, Pixel Art, Wordscapes, Jigsaw Puzzle, and Mahjong.